7/28 Cup of Coffee: Former first-round picks Matt Barnes and Pat Light (pictured) each had strong starts on Sunday, though only Light was able to pick up a victory. The Sea Dogs mounted an impressive comeback, and Greenville's offense hit the ball all over the park. Pawtucket could not extend their winning streak to 12 games, falling to the Scranton/Wilkes-Barre RailRiders (NYY), 3-1. 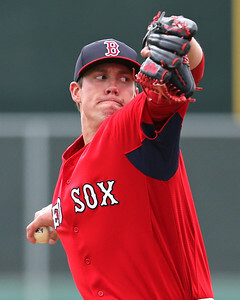 Matt Barnes pitched well in defeat, allowing two runs on four hits in five innings, walking two and striking out six. John Ely went the rest of the way, surrendering one run in his three innings of relief. There was not much to speak of offensively for the PawSox, with Ryan Lavarnway's double accounting for the lone extra-base hit. Lavarnway had two hits, while Will Middlebrooks and Mookie Betts each added a single. Down 5-1 in the sixth, the Sea Dogs scored seven unanswered runs to beat the New Britain Rock Cats (MIN), 8-5 in 11 innings. Luis Diaz had his first rough start for Portland, allowing five runs in five innings. The bullpen shut down the Rock Cats the rest of the way, with Pete Ruiz, Dayan Diaz, and Noe Ramirez combining to throw the final six innings, while allowing only four hits. Keury De La Cruz had the biggest hit, launching a solo home run in the top of the ninth to tie the game. Jonathan Roof added a double and a home run, and Michael Almanzar and Danny Bethea both had two hits, with Bethea lacing a double. Bethea's double broke the game open in the top of the 11th, plating two runs to help secure the victory. Behind a strong start from Pat Light, Salem blew past the Myrtle Beach Pelicans (TEX), 7-1. Light went the first seven innings, allowing only one run on four hits, walking three and striking out two. He induced 12 ground outs, while improving his record to 5-5 on the year. Kyle Martin and Kyle Kraus followed with scoreless innings out of the bullpen. Both Jantzen Witte and Kevin Heller slugged solo home runs, with Witte reaching base four times via three hits and a walk. Matty Johnson drove in three runs while going 2 for 4 with a double, and Dreily Guerrero went 3 for 4 with a double and two runs scored. Greenville's offense did not let up, as they defeated the Hagerstown Suns (WAS), 8-4. After a rough introduction to the Drive, Jason Garcia now has back-to-back strong starts, allowing two runs in six innings, walking two and striking out four. German Taveras struck out three over the final three innings, allowing one earned run on four hits. Several players sparked the offense, with Forrestt Allday leading the way with a 3 for 4 day, including a triple and two RBI. Wendell Rijo, Tim Roberson, Zach Kapstein, and Hector Lorenzana all had two hits and double, and Manuel Margot went 1 for 3 with a walk and stole his 32nd base of the year. It was a rough night for the Spinners, as they were tripled up by the Brooklyn Cyclones (NYM), 9-3. All five pitchers who appeared for Lowell allowed at least one run, with starter Reed Reilly allowing two runs in 3 2/3 innings. Mario Alcantara picked up the loss after surrendering two runs in 1 1/3 innings of work. Sam Travis and Jordan Procyshen each had a hit and an RBI, and Danny Mars went 1 for 3 with a run scored. Player of the Day: Pat Light improved to 4-1 in his last six starts, allowing nine runs in 35 innings, with five of those coming in his start on July 17. His strikeout-to-walk ratio over that span is only 16-to-14, but he has been generating ground outs at an impressive clip, averaging about nine per start. His ERA sits at an even 5.00, but he has bounced back from a rough June, and with a strong end to the year he can position himself for a placement in Portland at the start of next year.